Still 2 months to go before the seasonal Philippine Fashion Week. 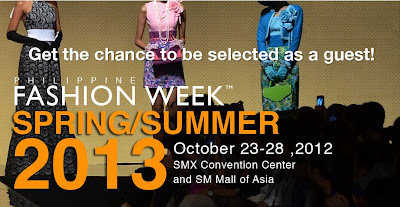 For those who don't know it yet, PFW Spring/Summer 2013 will be held on October 23 to October 28, 2013 at the SMX Convention Center and SM Mall of Asia. To get the chance to be selected as a guest, click HERE and register now!